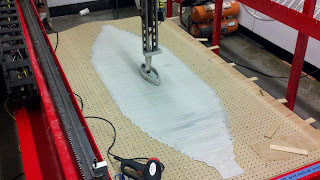 Following the success of Monday night's test print we only had one course of action: begin printing the boat. First we had to prepare for the print. We finalized boat dimensions, modeled the part in SolidWorks, countersunk hundreds of holes in the pegboard, and set up the build surface. We also decided to add a rheostat inline with the drill motor. 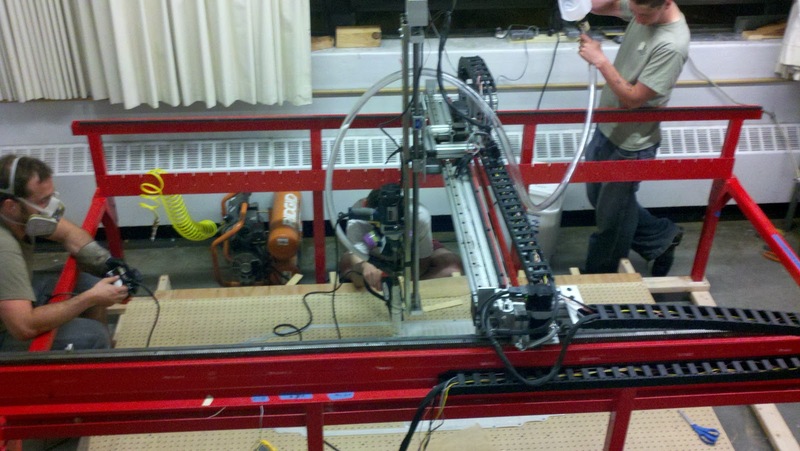 This would give us the ability to control our extruder without reaching into the machine as it operated. Compared to our track record of hitting every wall imaginable it was a relatively uneventful afternoon. 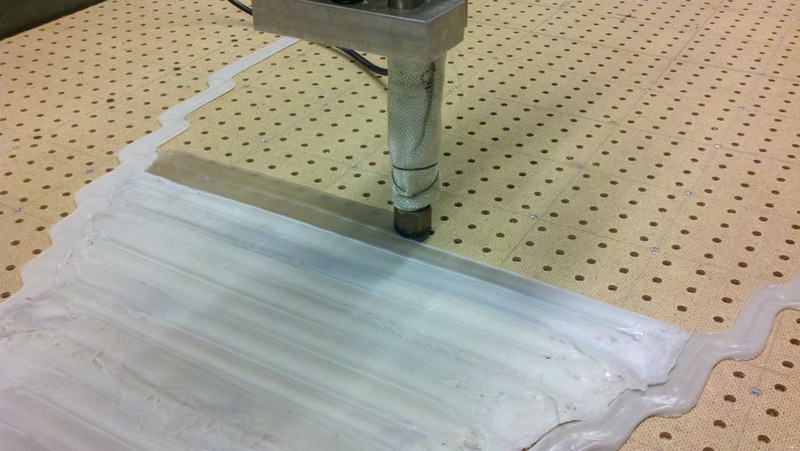 During the mid-evening we generated stl files and sliced them. Because we were only going to get one shot at the print we needed to make sure the g-code was what it needed to be. After a dry run for final confirmation we broke for dinner. With our bellies filled we fastened the pegboard down and built a rheostat. We were ready to go. Weeks ago we began joking about how our print would be super long, take a crew of people to make sure all was going well, and likely require working through the night. That joke is no longer a joke; it has become reality. Four of us operated the machine. We began printing at 11:00 pm and didn't finish the first layer until 3:15 am. 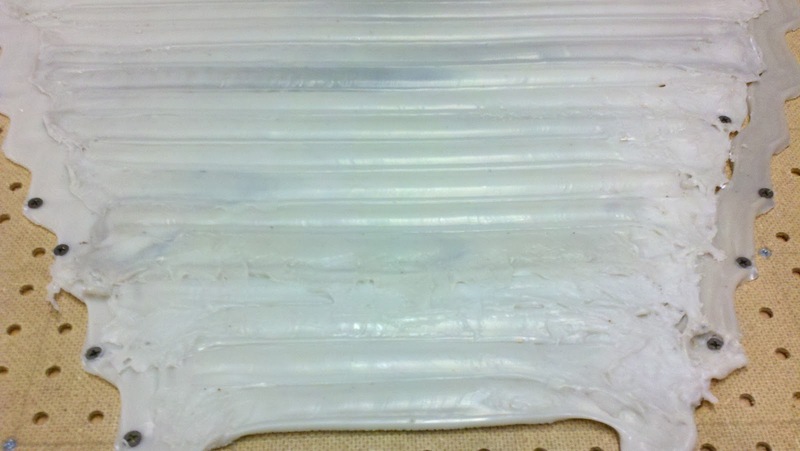 Our process took a short while to evolve, but we found a great way to make the print turn out beautifully. We ran the printer at 30% speed. 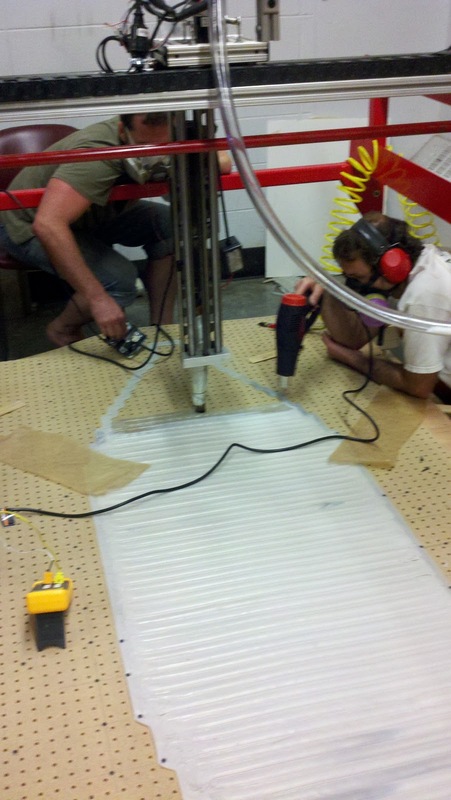 Adam sat at the end of the machine and controlled the rheostat so that too much HDPE was not extruded during turns. Brandon stood near the windows to replenish the hopper, screw down the pegboard if it began to buckle, and any other task that needed to be done. Matt and myself sat on either side of the printer and were responsible for "clean up". When the extruder would lay a bead next to a cooled bead it would not fuse to the old one. In more technical terms: the fresh bead did not have enough thermal energy to melt the cooled adjacent one so would not fuse. 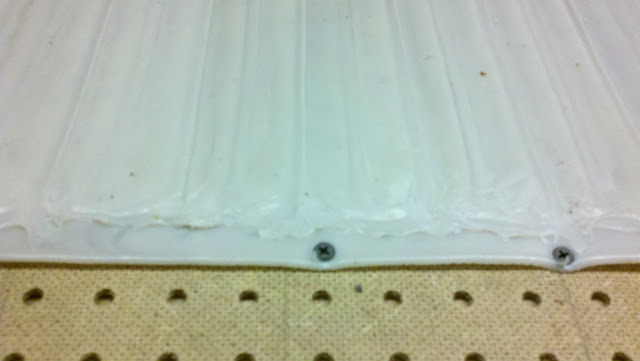 To overcome this we supplied energy with a heat gun to bring the old bead up to a fuseable temperature. The finished pattern looks great. 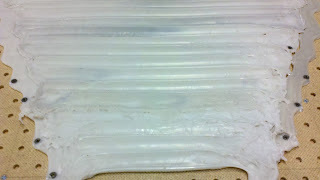 We learned some valuable lessons during the print. 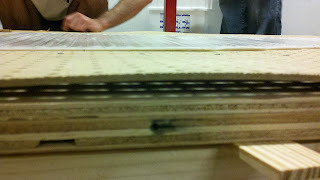 For example, the pegboard will begin to buckle if it is not fastened down with enough screws. We either need to start with more or keep adding them on the fly like we were doing. Another is how to make turns look beautiful. You can see in the image how some of the turns near the bottom aren't as nice as the later ones. Our clean up process was a little trial and error at first. Though there wasn't much error involved. At least not as much as we've come to expect. The other big lesson was that we can control the printer manually if the g-code fails, but you end up with a really bad looking print. That's what happened at the tip of the boat in the picture to the right. Of course it didn't help that our HDPE supply had been interrupted by a kink in the feed hose which lead to some bubbles. We left for the night (more accurately the morning) being exhausted. Exhausted, but elated. 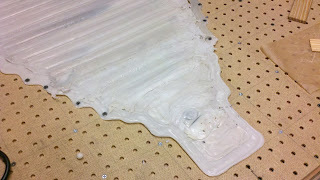 We successfully printed our base layer. The last thing to do is print the walls. 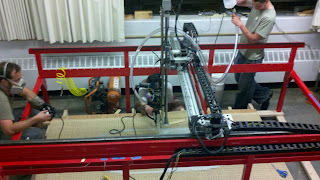 Our extruder is so loud that we need to do this sometime at night after the building is cleared. Even with the door closed the extruder can be heard in the mens room around the corner. Any pre-print tests should be done no earlier than 6 (to be courteous to the learning environment) and the actual print probably won't start until 9 at the earliest (because that's when parking is free). It will take several hours and requires a crew of at least 4 again (slightly different jobs but still as much labor as this print). If you'd like to be a part of this last stage get in touch with us and we'd be happy to put you to work. Email, comment, or just show up. We should be in the room after 10:45ish if you just want to drop by but if we're not it's because we are likely making a run to Scrap Blasters for more shredding. If you do lend a hand during the actual print respirators are optional (the fumes irritate some people, but we have decent ventilation). Hearing protection is strongly recommended. Even if you can't offer several hours late in to the night feel free to come by and oggle if we're in the room. Thanks to everybody who's helped in any capacity at all. It's unlikely we'd be here without your contributions. Wow. Fantastic job guys. Thank you so much for your continued effort and hard work. I am looking forward to seeing the print later. Thanks Zach. We owe a big thanks to Forrest Higgs and Nop Head. 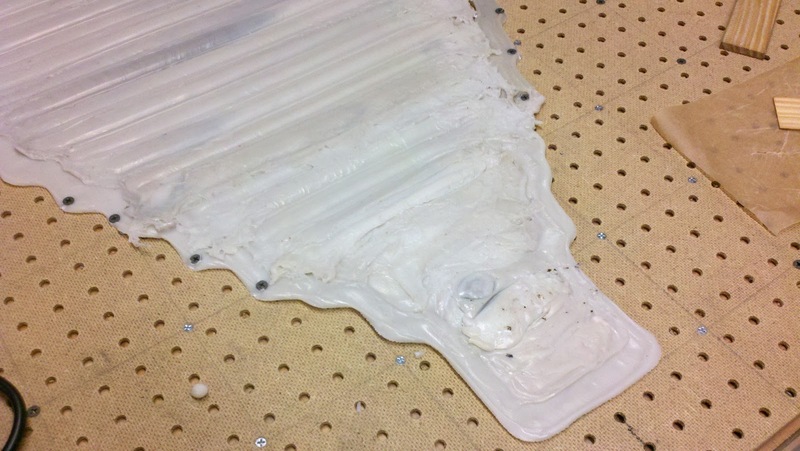 Their pointers on printing with HDPE got us on the right track. what do you mean by 'if the gcode fails'? I think that Mark was referring to a few possible problems. The printer hasn't been fully calibrated yet, so the g-code (generated by Slic3r ant then modified for the CNC machine with our own script) may not have yielded the desired result, leaving holes in the bottom of the boat. Also, the CNC software seems to crash every now and then (buffer underflow?). We just didn't have time to start over on a 16 hr print.